Hello sweet friends! I’m popping in today with a new card and simply to say hi. I’m ticking along in the background, while savoring some of the good weather that is coming my way. Today I’m using a color I don’t often use and I’ve reached for a border that has been in my stash for quite some some. If you have or are curious about the Spellbinders Graceful Frame Maker, the border that I’ve used here practically cuts itself. I have a video that shows how the tool works – HERE. I’m using Spellbinders Renaissance Border One. Since this border cuts its own straight edge, that means you don’t have to trim it and makes it extra easy for use with the Frame Maker. This card is 6.5″x 6.5″and goes together so, so easily. I simply cut my frame with the 6″x 6″ Frame Maker and layered it with two frames cut using Spellbinders 6 x 6 Matting Basics A. The largest mat made with the largest two dies in the set are simply glued to back of my frame. Then I cut a smaller square frame to highlight the aperture. 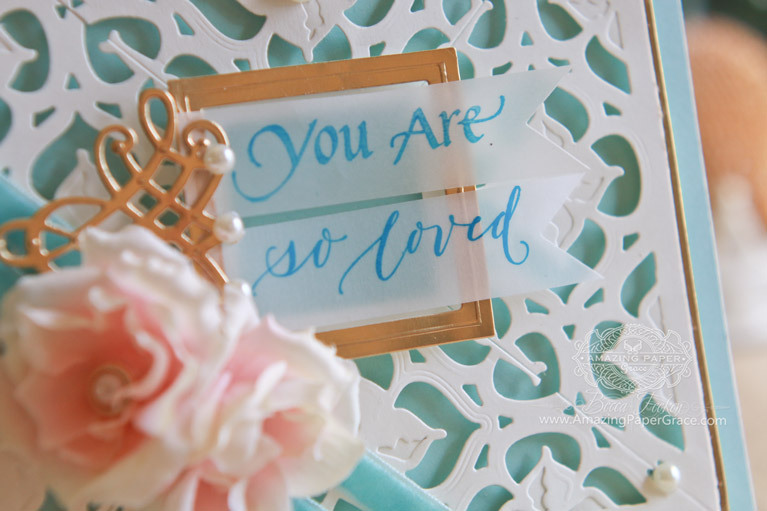 Two banners cut from Spellbinders Decorative Swallowtail Tags and stamped them with a sweet new set of sentiments from Quietfire Design called You Are. For new readers, every Friday it’s my pleasure to give away a card. The card goes to a randomly picked reader (worldwide) who leaves a comment in our conversation. Want to know more about Day of Giving, here’s a link to my FAQ’s just check out #11. You can check the list of winners HERE! For your comment: We hand down our customs from generation to generation. What custom has been lost to the current generation that you’d like to see make a come back. This is so close to my heart, even I left a comment on my own blog, because I wanted to weigh in with this – pop up to the top of this list, I’m #8 down, but don’t forget to read them all because this lovely group is a wise group too!! Have a fabulous weekend sweeties! Thanks so much for stopping by! Sitting together as a family to eat. As a child we did very little of that. When my children were little we got to do this and it was wonderful. With you all the way on these, Becca! I can agree with all of your readers but I would love to hear people being polite to one another. Just a simple ‘Good Morning’ will do. Gorgeous card! Love the colors and details! 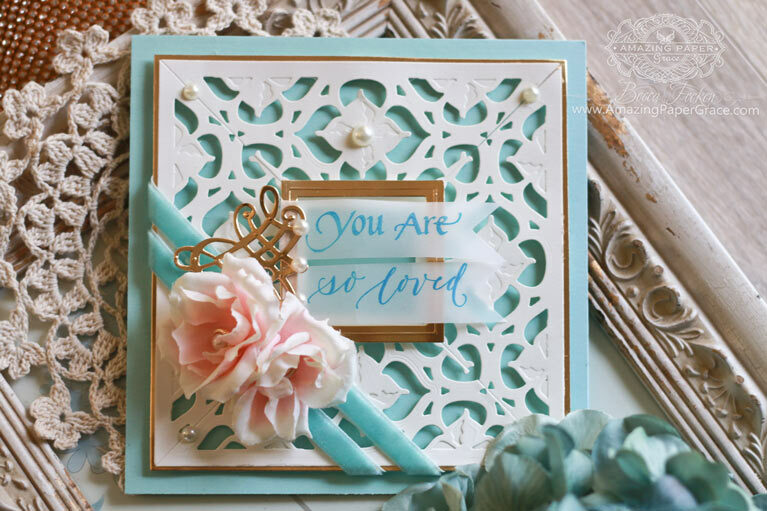 Another gorgeous card and love the colors and the sentiment. Marilyny, I am thinking the very same thing. I am only 44 and have one grandson my daughter refuses to let me see at all. I think they made a huge mistake by taking the Home EC Classes out of the School system where I live . So many children are what we term “Latchkey” Kids and have never had the time with their very hardworking parents to learn the basic life skills they need to just get through every day things. I know , I was one but I was determined to learn what I needed to survive and I had wonderful home EC Teachers that taught me more than just setting up a house. They taught me how to respect myself and others, taught me how not to give into the Peer Pressures, how not to judge myself so critically since I came from a very traumatic background. Taught me how to actually see myself as a lady worthy of love instead of just an object to be misused, neglected and abused. They gave me a love for life and the crafts I now enjoy immensely. So I say Thanks to Virginia Higgins (Sewing Class) and Ms. Ragsdale (Cooking Class, YAC). This would be my Custom to bring back. Mentors for young girls who may not have the support at home. What a lovely card, Becca, the color really gave my heart a lift. Just beautiful and what could be better than receiving a message filled with love? I really feel I am the good company of kindred souls. Why? It touches my heart to hear of the outpouring of love and caring from your dear readers. Women of such generosity. Women that send cards, handmade cards…sending love in an envelope. So much today is focused on the fastest and easiest…emails, Facebook. I think we should be mindful of how we spend our life. It’s good to ask myself, “What will feed my soul?” “How can I live in integrity with who I am?” Okay, I’m not fast and I do things in a time-intensive way. I really feel out of “synch” with most of the world but being connected with this community has made me feel less alone. 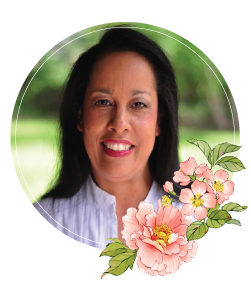 WOW, I am over the moon in love with your card today, your turquoise is just so refreshing and your ribbon with the pink flowers is a perfect pair, ahhhh! Oh your question today, WOW, I could answer it in so many ways, I totally agree with your comment, you are so right on with thoughts. The current society (young adults) and our future (students) is self centered and have no clue how to say, do, express themselves unless its to “whine” that they aren’t being given what they want now. I would love to see respect for life return! It would mean more family time, dinners around a table, actually pay attention to your children, teach your children life skills, including respect, please/thank you, remove all the “horrible” video games, teach your children what the outdoors is like. I won’t rattle on and on and on, I love all your bloggers posts, it seems to me all these paper crafters understand what is needed in our world to make it a peaceful, loving society! Another lovely card! I love this color!! Love the frame maker! So many things to do with it. Absolutely stunning card Becca. The roses are such a lovely touch. As far as crafts, I think knitting and crocheting are not being passed down as they used to be. Fewer of the younger generation seem interested. Gorgeous card Becca!!!!!! Thank you for sharing your inspiration with us!!! I would like to see more smiles, please and thank you, and you are welcome!!! Your card is as usual very beautiful Becca and I love the teal color on it too. My wish is for appreciation to come back simple but important. I am currently moving house so have no spare time to craft at the moment. I love the elegance of your cards. A very beautiful card again Becca. I miss writing letters , respect , and good manners most of all. A lovely card! The background looks like one solid piece because you mitered the corners with your Frame Maker die. It does an amazing job! I’d like to bring back church on Sunday and a family meal after then family fUn and relaxation after. If you are in church, seems like everyone goes out to noisy restaurants after or runs off in different directions. I would also like letter writing personal letters to come back. I have my Grandparents love letters from 1919 and cherish them. People aren’t leaving that kind of legacy behind anymore. Oh my word this is gorgeous and shows your wonderful dies off to perfection. I’d like to see more good manners, such as holding a door open. Little things like that which were second nature when I was a child. 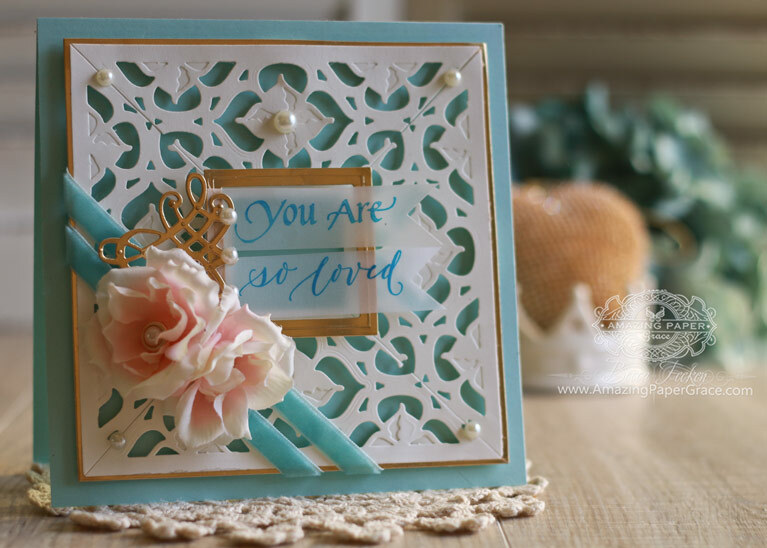 Hi Becca, A very beautiful card with your gorgeous dies and the flowers are so pretty !! I echo your sentiments on customs you would like to bring back. Also, in my opinion, the younger generation don’t seem to have the same values that my generation were brought up to have. They seem to live their lives on Facebook or equivalent, which in turn makes them unhappy and depressed that their lives are not the same. Also, they don’t have the art of conversation anymore, I know that texting and emailing are brilliant, but the words that the ‘sender’ uses may not be the same as what the ‘recipient’ thinks they mean, because the interpretation may be different. I also wish that more people would go to Church, they only seem to go for Weddings, Funerals and Christenings, and don’t seem to realise that the Churches have to ‘survive’ and rely on people who patronise them on a regular basis. My final ‘moan’ haha, is that the whole ‘meaning’ of Christmas is non-existent, the main focus is now on how many presents they can buy or receive, instead of the Glorious day that our Lord was born, the majority of Religious occasions seem to be forgotten and people only see them as days off work or similar, the whole occasion is forgotten. I will get off my ‘soap box’ now hahaha. I wasn’t going to chime in on this post because I am a day late in getting to read your blog. The advantage of being a day late is that I got to read everyone’s comments. I did think of something that no one else has commented on. I would love to see the return of a good work ethic. Of course, there are many other important things already mentioned, like prayer in schools, going to church, listening to others, good conversational skills, and the ever waning properly written thank-you note. (Aren’t we sick of opening a thank you card that has only one line written in it?? If we are fortunate enough to even get a card, and not a text….) But the good work ethic is becoming extinct. I love your card. The colors are beautiful and you did such a great job on it. Saying thank you. I have found young people quite often do not acknowledge a card or birthday gift but just take it as their right. I sound picky I know but sometime you don’t even know if it arrived! Beautiful card. Just rec’d my new frame die and so glad you added the link so I can review how to use it before I wasted my paper. What a beautiful card. I could say so many things about this topic. Wow where do you start? I would bring back the custom of eating together everynight as a family (so many families do not do this anymore due to work commitments), saying grace & giving thanks, cursive writing in schools, Less computer learning & more craft in primary schools, Getting a phone call when you get the job instead of an email, less txts more phone calls especially when its inportant.